Most of us who think about Tibetan history are aware of the longstanding activities of missionaries in that country. From António de Andrade‘s mission in the early seventeenth century through today, missionaries have long sought a foothold in Tibet. And sometimes they leave a relic behind to remind us of their dedicated and industrious efforts to spread the gospel. Case in point: my new copy of John Bunyan’s Pilgrim’s Progress translated into Tibetan by by the Revered Evan Mackenzie, F.R.G.S. and published in London by the Religious Text Society, sometime before 1931 (more on the dating of the text later). Translating from Tibetan is a difficult task, but translating into Tibetan is something else again, and the Rev. Mackenzie deserves credit for this difficult work. I also can’t help but feel that Bunyan’s epic allegory is an interesting choice for translation in this context. Offhand, I can’t think of any Tibetan works that rely on the same type of extended allegory (I’m sure my ignorance will soon be corrected by an alert reader out there somewhere). At the same time, some of the images, such as a man burdened by his past, or the idea of treading a religious path, resonate with Tibetan religious notions, so perhaps it is a good selection. 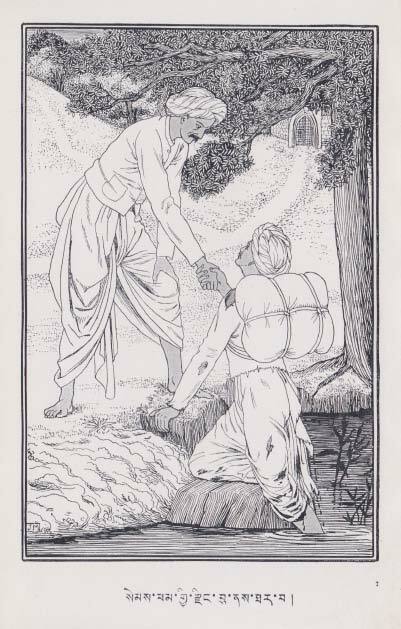 The book itself is well made, printed on good paper, and includes several wonderful illustration (interestingly, the figures are dressed in Indian garb, and some show captions in Devanagari. Perhaps they were cribbed from a Hindi edition?). Clearly, the Religious Text Society cared about what they were doing and invested the time and money in turning out a good product. As for the translator, I have been able to find out very little about him. The only reference I have found, in fact, is a brief note of thanks printed in Adventures and Travels in Tibet, a 1901 account of missionary travel, where he is listed as residing in Kalimpong, India (thank you, Google Books). The Kalimpong connection is interesting, as it was also the home of the Tibetan Christian G. Tharchin’s Tibet Mirror, the first regular Tibetan language newspaper, published from 1925-1961. The literary arts, it seems, were flourishing among the Kalimpong missionaries and their converts. Figure 3: A Typescript translation of a letter from the Thirteenth Dalai Lama. My copy of this text included two such letters, with identical text, but, alas, not the original letter in Tibetan. As far as the impact of the work, I have no idea if it was ever widely distributed in Tibet, but it does seem that at least one Tibetan, the Thirteenth Dalai Lama, received a copy. The volume I bought on ebay contains two separate typewriter-typed translations of a letter from the Great Thirteenth, dated the tenth day of the tenth month of the iron-sheep year (1931; this is how I know the book must have been published prior to 1931). In the letter, the Dalai Lama thanks the Religious Tract Society for sending him a copy, though, as he points out, “it is difficult for us who accept and spread the doctrine of those who wear the Yellow Hat to accept and live that religion” (see image 3 for the rest of the letter). 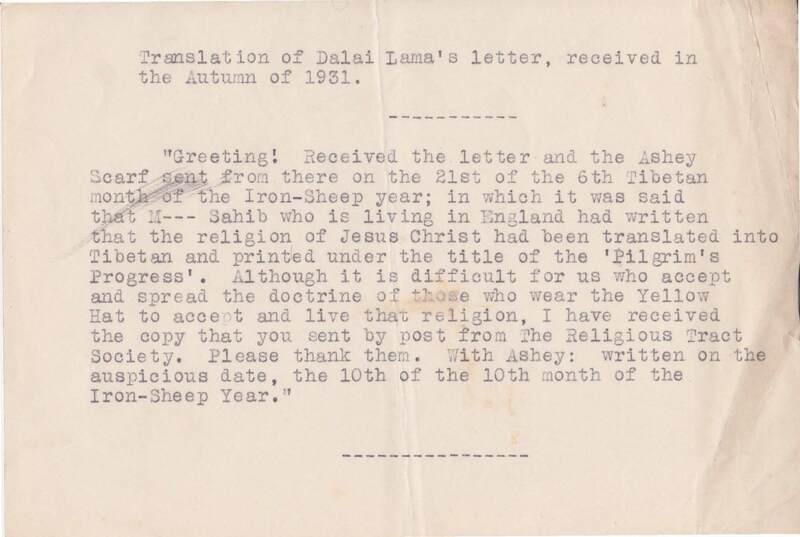 So not only did the Tibetan missionary community have the linguistic ability to make the translation and the economic ability to have it published nicely, they also had the connections to get a copy into the hands of the Thirteenth Dalai Lama. That seems pretty impressive to me. Or perhaps not, perhaps these contacts were fairly routine. So I don’t know if this little textual relic actually tells us anything new about the history of missionary activity in Tibet. Perhaps it does, but more likely not. In any case, its pretty neat. If you happen to know anything about the Reverend Evan Mackenzie, have a similar text sitting around, or have any other information on early twentieth century missionaries to Tibet, please leave a comment! And now a quick note about my new ‘Liebster Award’ (that would be German for ‘favorite’). Apparently, this is an award to recognize and bring attention to good, small-time blogs. Each recipient is nominated by a peer in the blogging community and in turn is supposed to nominate three other blogs. My award comes courtesy of Dan Martin, of Tibeto-Logic fame. The whole system has a vaguely ponzi-scheme feel to it, but it is certainly gratifying to receive encouragement from someone of Dan’s caliber. In the interest of not exacerbating the pyramidal tendencies of this particular phenomenon, I’m going to restrict myself to nominating two blogs, rather than three to five. They are Sam van Schaik’s excellent Early Tibet and Robert Mayer and Cathy Cantwell’s equally excellent kīlī kīlaya. So, for whatever my endorsement is worth, please enjoy these sites, and encourage them to write more! Congratulations on getting that Liebster! It’s not every day you get a prize for something. 135. To Gandhi (on Ahimsa, of course). Iron Sheep (1931). 136. [76v] To Suydam Cutting. Iron Sheep (1931). Informing him that the Dachshund, Dalmation and gold watch arrived. 137. [77r] To Suydam Cutting. Iron Sheep (1931). About sending Lhasa Apso. 138. [77v] To American Wool and S. Cutting. Iron Sheep (1931). 139. [78r] To same. Iron Sheep (1931). Rockhill mentioned. Got letter from American President and how he is going to help Tibet. 140. [78v] To same. Iron Sheep (1931). Autographed picture of President Hoover. I’m off to have an adventure, so will talk later. Alas, I have not the time to pursue the Great 13th’s letters, fun as it would be. I particularly like the exchange of dogs with Suydam Cutting. According to Wikipedia, those were the first Apsos in the United States……. And perhaps the first Dachshund in Lhasa? My mother’s grandfather was the said Rev Evan Mackenzie, her father, also Evan was born in India in 1906 and she was born in Scotland and is now 68. I remember being in awe of a Tibetan Prayer Wheel (that had belonged to him) when I was a child. I was not allowed to touch it too much as I was a bit clumsy! I am Michelle’s mum. My paternal grandfather was the Reverend Evan MacKenzie. He was a missionary in The Dr.graham Homes in kalimpong, India. My father, also called Evan,was born in Kalimpong in 1906. I have a copy in my home of Pilgrim’s Progress,in Tibetan. My Grandfather died in 1934,so unfortunately I never met him,as I was born in 1945.He came back to Scotland and worked as a Church of Scotland minister in Invermoriston,where he is buried. 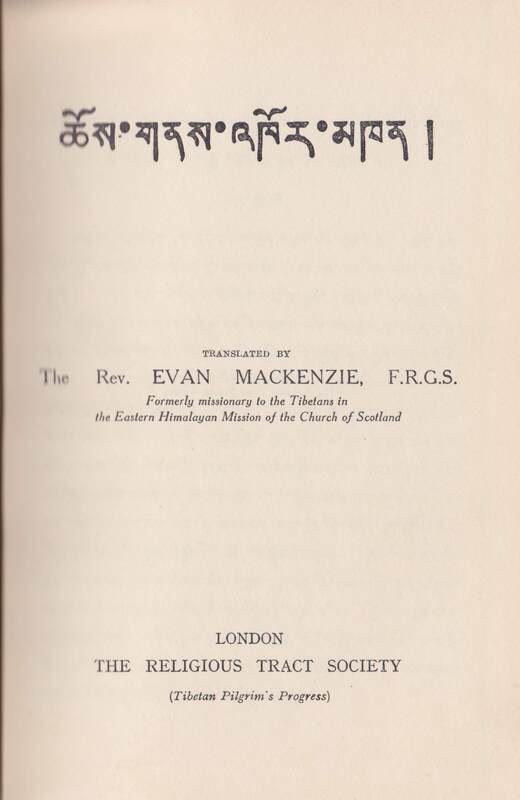 I believe Evan MacKenzie was one of the original members of Annie Royle Taylor’s ill fated Tibet Pioneer Mission. Some members of this mission, not including MacKenzie, were regrouped under the leadership of Cecil Henry Polhill (1860-1938) and relocated to the Sino-Tibetan border. In 2008 I visited Polhill’s ancestral home and discovered a large number of letters including several from Rev. MacKenzie. Polhill continued to take an active interest in MacKenzie’s ministry including sending some large donations. These historical documents are gradually being uploaded to a digital archive that I manage at the University of Birmingham, UK. Do get in touch if you’d like to know more (would be good if the editor could help me get this message to Evan MacKenzie junior who has commented above). John. We are the grandaughters of the Rev Evan Mackenzie.Our father was Evan James MacKenzie born in Kalimpong in 1906. He was the brother of Rodderick, father of the aforementioned Evan MacKenzie now living in France.He is our cousin.We both have copies of the Pilgrim,s Progress in Tibetan and other Tibetan Literature and photos. Our maiden names are Isobel and Elizabeth MacKenzie. Hi everyone, all of Rev Evan MacKenzie’s correspondence with Cecil Polhill is now online at the Polhill Collection Online just search ‘MacKenzie’. Enjoy! I am tibetan believer and do networking with tibetan Christian and other who are working with them.its interesting article to read.contact me if you ave any articles in ti en christin history .